Sci\ART™ assigns colours into 12 harmony groups, each of which is focused on different predominant colour characteristics. Not all harmony groups contain all the colours of the rainbow, but all 12 tones get their versions of primary hues such as blues, greens, yellows and reds. The personal colour analysis system we use at Chromology is called Sci\ART™. Developed in 2000 by the late Kathryn Kalisz, Sci\ART™ is a state-of-the-art colour analysis method designed to accurately identify a person’s natural colour tone, positioned within a three-dimensional colour space. Kalisz was an outstanding artist and scientist who dedicated her life to the study of colour and its use and affect on human beings. Employed as a colourist at the Munsell Institute, she quickly became fascinated with the science of colour; it was this fascination that led her to study colour and psychology and eventually develop the Sci\ART™ 12 tone personal colour analysis system. Kalisz’s work was influenced by 2 great colourists, Johannes Itten (1888 – 1967) and Albert H. Munsell (1858 – 1918). Itten, a Swiss expressionist painter, designer and theorist, is known for his teachings on colour and his work is said to be a primary inspiration for seasonal colour analysis. Munsell, an American painter and art teacher, created the Munsell Colour Ordering System which gained international acceptance and is considered to be the standard for worldwide colour communication. In the Munsell System colours are placed in relation to each other in three-dimensional space, as opposed to representing colours in a two-dimensional colour wheel that is still commonly used in traditional art and colour teachings. The arrangement of colours inside the Munsell Ordering System are set out to flow according to the order in which they visually appear to flow in nature. Since Munsell organises colours into three-dimensional space, to accurately communicate the characteristics of a single colour we must define it via the three dimensions: hue, value and chroma. HUE is the characteristic by which we distinguish one colour family from another, such as blue from green or yellow from red. Hue is also considered the “emotional” dimension because it carries the most psychological associations. VALUE is the attribute that allows us to differentiate between the various lightness and darkness levels of colours. Of the three dimensions value carries the most informational content of colour because our visual perception is most sensitive to changes in lightness and darkness. This is the quality that communicates highlight and shadow and helps define shape, form and proximity. CHROMA is the dimension by which we identify the strength or intensity of a colour, such as distinguishing a vivid colour from a dull colour. If hue provides the emotional content of a colour and value gives most of the informational content, then chroma can be considered the “attracting” quality. 1. Our subjective colour choices are indicative of our personality. 2. Our physical colouring is a directing factor in our choices of pleasing colour combinations. For example, a high contrast brunette would often choose dark colours and compose more intense, high contrast art whilst a fair person of low contrast would more than likely choose less vivacious softly blended harmonies and opt for hue contrast over value contrast – loosely referring to the contrast difference between true summers and true winters. 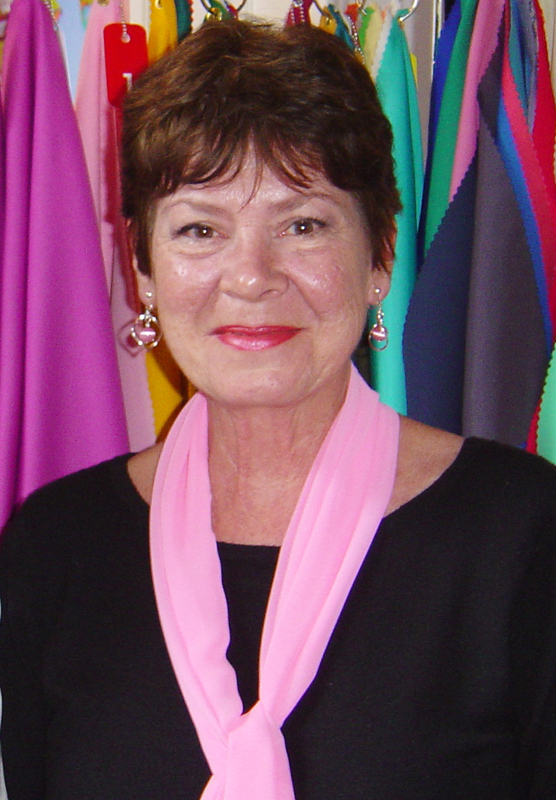 Itten linked ‘subjective colour’ to the four seasons: Spring, Summer, Autumn and Winter, which in turn influenced Suzanne Caygill, an American fashion designer, and ultimately led her to develop the four season colour theory. Caygill categorised people into one of four distinctive colouring groups: Spring, Summer, Autumn and Winter. In her book Color: the Essence of You (1980), she also identified a wide range of sub-groups within each season – such as ‘Early Spring, ‘Metallic Autumn’, or ‘Dynamic Winter’, each with its own set of special characteristics. Recognising the need for further defining the subdivisions of the four seasons, in 2000 Kathryn Kalisz introduced a ‘science meet art’ approach and launched her 12 tone personal colour analysis system called Sci\ART™. 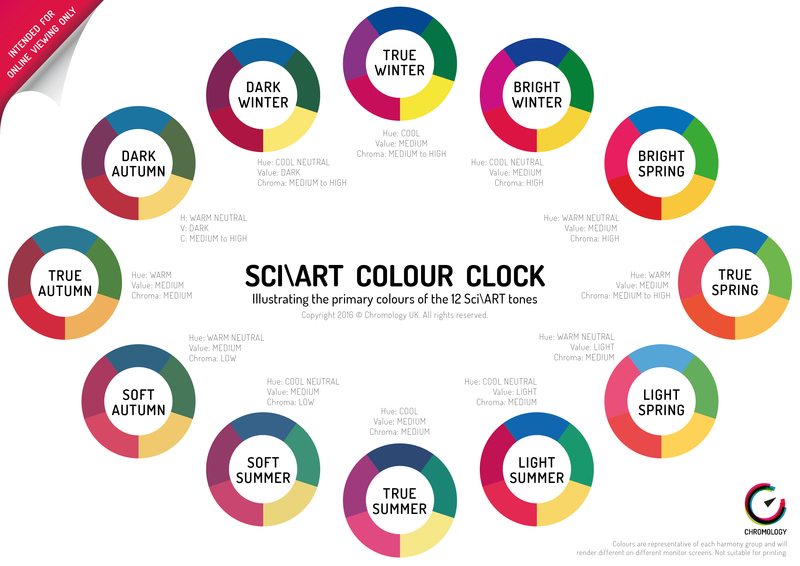 Sci\ART™ is the most highly advanced and scientifically accurate personal colour analysis theory we have today. In Sci\ART™ a single colour can only be assigned to one harmony group, so a specific shade of yellow will only belong to a specific colour group or ‘season’. The way in which a particular colour’s tonal home is determined is by means of visual evaluation of how the colour appears, or ‘behaves’ when placed in the 12 different harmony contexts. In traditional colour analysis a person’s physical appearance is a major factor when determining their personal colour tone and there are no strict scientific measures, meaning the end result is based on the analyst’s artistic judgement. Sci\ART™, on the other hand, eliminates stereotypical colouring assumptions and instead relies upon ‘measured data‘; as such, the tools we use and the environment we work in must be controlled to conclude an accurate and repeatable. Unlike more traditional methods of colour analysis which tend to use 1 inch colour samples held a distance away from the person’s face to look for clues as to whether the colour appears harmonious with the person’s natural colouring, Sci\ART™ analysts work in a colour neutral environment, use full spectrum lighting and 33 inch (85cm) wide colour samples. This eliminates stereotypical assumptions from hair, skin or eye colour and instead allows the analyst to measure the physical effects and optical illusions of the colour as it’s visibly projected onto the person’s face. Large colour samples are crucial because one can only observe the visual effects of a colour if the colour size to scale and is adjacent to the person. If we are advising clients about personal clothing colours, the very least we should do is test with ‘clothing scale’ samples to make sure our advice is well reasoned and backed up with practical evidence and visual results. Kalisz teaches that “Beauty will always present itself as one unified whole” and that “Our personal colouring is as individual and unique as our fingertips“. So if we’re all individually coloured, why did she develop a system that categorises people into pre-defined, collective groups? The answer lies within the practicalities of the consultation; in a relatively limited amount of time we need to carry out a large number of colour comparisons, continually observing and noting the various colour affects and ultimately pinpointing the individual’s three-dimensional colour tone. Simply put, if we were to compare individual, ungrouped colours from the Munsell System, and accurately assess the results your consultation would last days. Comparing sets of pre-defined colour tones against each other also helps with checking for recurring patterns and consistency in the readings, which would prove more difficult if we were to try and navigate our way through individual, ‘unorganised’ sets of colour samples. Feeling inspired? Take a look at our personal colour analysis page, where we’ve summarised the benefits of ‘getting your colours done’.